If there has been any theme to the NEO Endurance Series’ P2 class this season, it has been the fall of favorites during each race. As far back as pre-qualifying, at least one top team has encountered problems and dropped out, setting the stage for some unexpected winners and podium contenders. In that sense, the latest round at Suzuka didn’t disappoint, although the contenders whose races ended in a crash might tell you otherwise. The story of fallen favorites in the fourth round of the season begins with the polesitter. Team Heusinkveld’s Ronny Fantini put the #35 HPD on the pole for the first time this season, giving them the advantage of clean air at least for the first few laps not plagued by traffic. Throughout the first stint, Fantini was hounded by Race Clutch’s Yohann Harth, and a quicker pit stop and outlap for Harth put him ahead of Fantini. However, he didn’t emerge with the lead — at least not immediately. Fantini leads Harth during the first stint. Instead, a clever off-sequence strategy by IRDK Endurance, which brought Egil Sandfeld into the pits before the HPD field hit GT traffic for the first time, put their #55 car atop the scoring pylon after the rest of the field had made their first stops. Once Race Clutch cycled through to the lead, they got a bit of an assist from a Team Heusinkveld mistake. On lap 49, Fantini’s late dive into turn 1 while trying to pass the Team Buschfink Racing Porsche led to contact between the two cars and a stop-and-hold penalty for Heusinkveld. 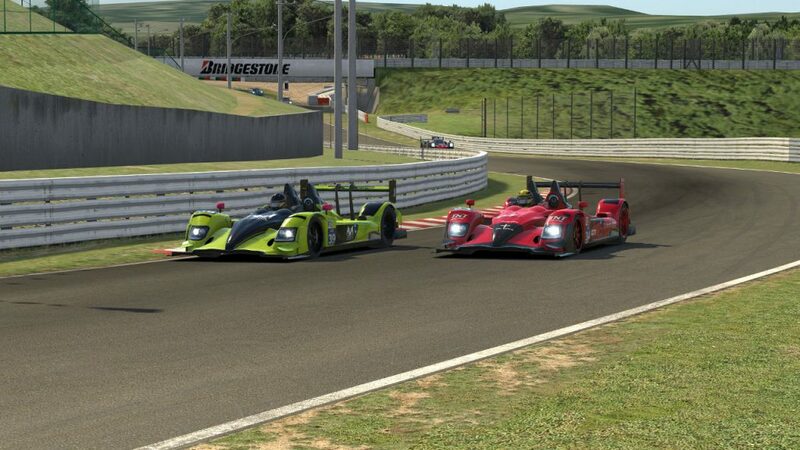 Race Clutch then had more than a 20-second lead over Inertia SimRacing Corsac, but the plight of P2 favorites was about to strike them once again. On lap 60 while attempting an outside pass on a GT car exiting the Casio Triangle, Harth ran out of room and clipped the grass, which sent the #57 car spinning nose-first into the tire wall. The damage forced them into the pits for repairs and dropped them down to eighth in class. The stressful second hour of the race for the HPD leaders shook up the standings at the front of the field. Inertia’s Joonas Vastamäki assumed the lead while TNT Racing moved into second place and Torque Freak Racing, which qualified in third but plummeted after serving a speeding penalty during their first pit stop, made it back inside the top three. TNT and Torque Freak weave through traffic on the backstretch. SRN Motorsports’ Scott McGarvey ran as high as fourth during his double stint and the RoadBasterds’ Sven Riedel gave the #40 HPD a strong run up to fifth place. The P2 running order was nothing if not chaotic, though, so it didn’t take long for those positions to change again in quick succession during a 10-lap period in the middle of the race. Shortly after his third pit stop, Vastamäki spun all by himself into Spoon Curve, promoting TNT’s Robert Tinsey to the race lead. Six laps later, Torque Freak’s Dirk van Tulden caught Vastamäki and spun him in the hairpin, which put the #48 car onto pit road to serve a penalty and dropped them out of contention. Perhaps the biggest heartbreaker of them all came just four laps after that. Some quick laps and the incidents ahead allowed Harth to drive back to second place, but after spinning in the esses, the Race Clutch car was hit by the second-place MSI eSports GT car. 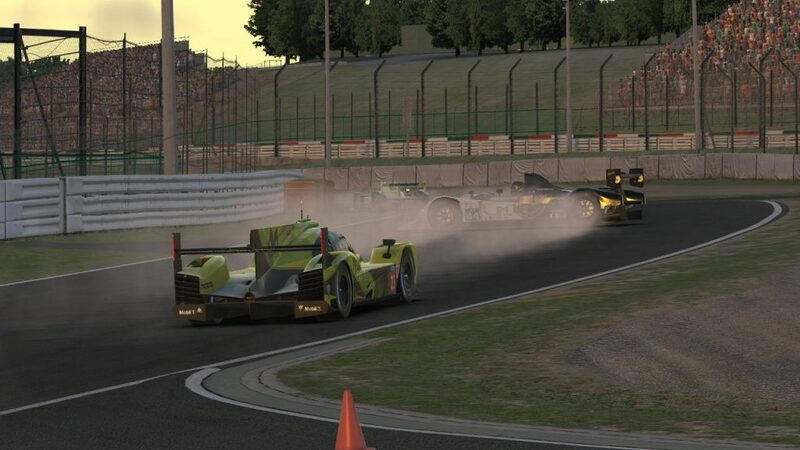 A pair of second-place cars crash while the UI1-Positive SimRacing prototype sneaks by. This proved to be a heavier hit than their first incident, and less than 30 laps later, Race Clutch retired for the fourth consecutive race this season. While their chances came crashing down, another team’s hopes were continuing to rise. AVA Vervatic, the winner of the first two races this season, started in second but fell to the back of the field due to an early technical problem that forced them to tow back to the pits. Although that could have been a race-ender for some teams, AVA’s lineup of Pascal Stix and Sven Neumann have shown speed and consistency all season, especially in their wins at Sebring and COTA. Both drivers were again up to the task at Suzuka, and just before they pitted on lap 118, their familiar lime green #39 car was back in a familiar position: the race lead. TNT came out ahead after that round of stops, but a quickly closing Stix caught up and got by after Paul Darling’s bobble in traffic exiting the Degner complex on lap 130. It had taken the better part of four hours, but AVA successfully completed their drive from the back of the field to the front. From there, they avoided the leaders’ curse in the final two hours and brought home their third class victory in four races this season. Stix passes Darling for the class lead. Darling maintained a consistent pace until the finish to secure second place for TNT — their best result of the season. The fight for the remaining top-five positions came down to some close racing and controversial rulings in the final laps. After IRDK and Inertia made their final pit stops with 21 laps to go, SRN briefly assumed the third position but couldn’t hold off the hard-charging Marcello Maio, who re-took the spot with a pass down the frontstretch. After that, SRN’s Mike Young had his hands full with Team MAD’s Diogo Melro. Contact between their two cars in the hairpin with 10 minutes to go resulted in a post-race 40-second penalty for Melro, but at the time, the on-track fight was anything but settled. As Melro drove away, Young pulled across the track into the path of the Interlagos-winning Schubert Motorsport car. In another post-race review, officials gave the SRN team a 25-second penalty — the equivalent of a stop-and-go — as well as a 40-second penalty for a later incident with the #91 TRITON Racing GT car. While Team MAD crossed the finish line in fourth place, their penalty dropped them back to fifth and Team Heusinkveld moved up to fourth, although that was little consolation to the polesitter and early leader. 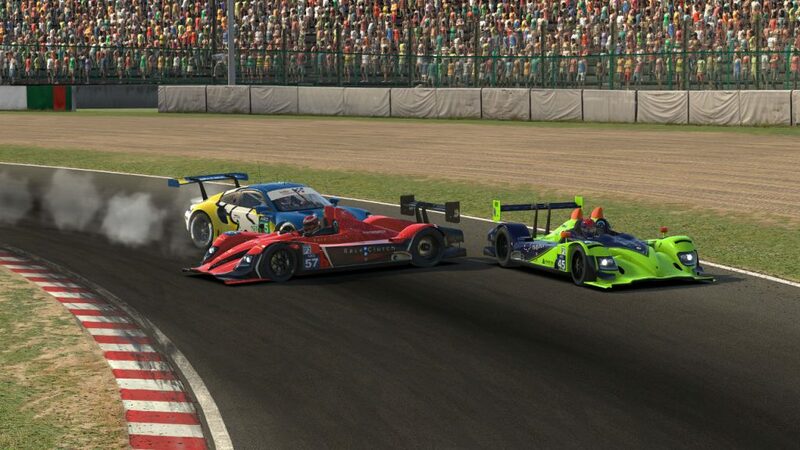 SRN leads Team MAD through traffic before contact occurs between them. SRN’s pair of penalties demoted them from sixth to seventh, while Inertia SimRacing Corsac moved up a spot to sixth — a mere silver lining around the dark cloud of the one-time leader’s race. The eighth-place finisher, UI1-Positive SimRacing, also incurred the wrath of officials, suffering three penalties during the race. 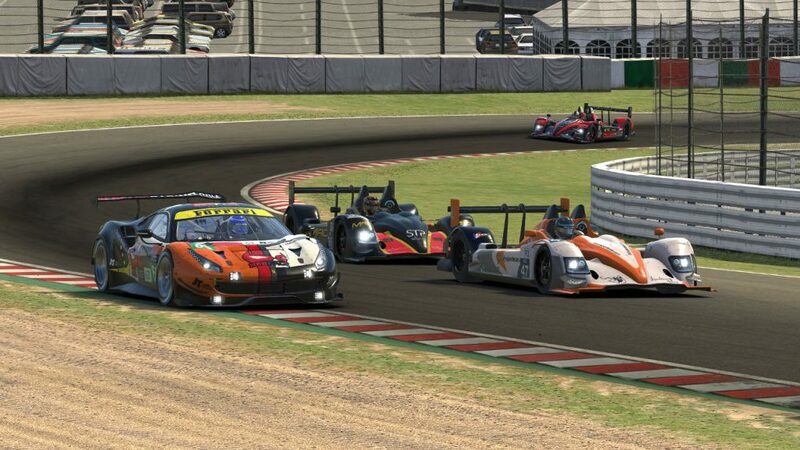 World of SimRacing Team moved up to ninth place after passing the damaged Schubert car in the final laps. Meanwhile, Schubert’s Moritz Fricke managed to limp home in tenth. 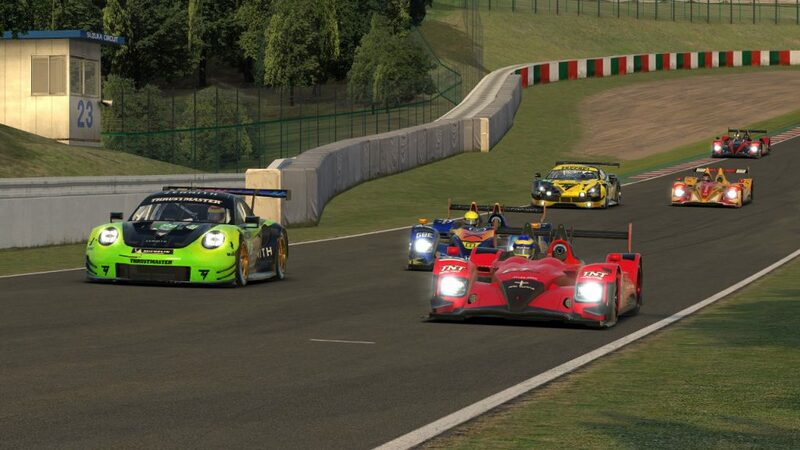 It was an eventful race for the Luxsim24 MOATF Podcast team. They missed the grid and emerged on track behind the entire field, and the setbacks kept coming from there. A first-lap incident while navigating through GT cars forced them to tow back to the pits, and a pair of spins in the first hour kept them firmly at the back of the P2 field. The Luxsim24 MOATF Podcast car spins in Dunlop Curve. Alex Trainor had better luck behind the wheel than teammate Neil M. Andrews, and their team managed a respectable eleventh place after a wild and wacky start. 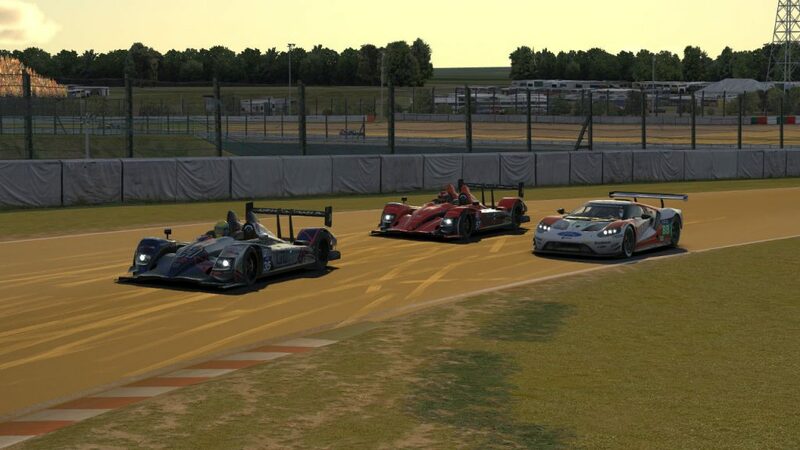 Behind them, iRacing Today Motorsports matched its season-best Sebring finish of twelfth place. A pair of class favorites who had trouble at Suzuka were the final P2 cars running at the finish. Apex Racing UK had an uncharacteristically poor qualifying result of sixteenth, and after climbing inside the top ten, a hard crash at 130R brought them back to the pits for extended repairs and, ultimately, a thirteenth-place finish. Torque Freak’s race, which went downhill beginning with their penalty for contact while racing for second place, also included a 10-minute stay on pit lane for repairs, and it left them six laps behind the class winner in fifteenth. Race Clutch’s misfortunes that culminated in a sixteenth-place run and a DNF are well-documented, but two other teams also had their Suzuka races come to an early end. The RoadBasterds car races three-wide down the frontstretch. The promising early run for the RoadBasterds was done in by a heavy crash at the Dunlop Curve with just over two hours remaining. 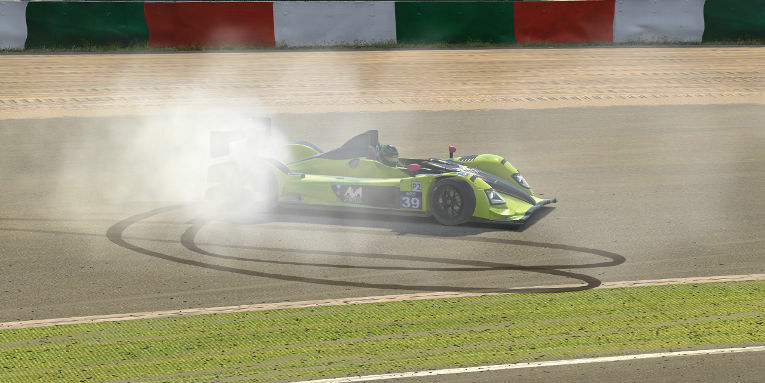 And RacingCenter Vib3sports didn’t even complete the first hour before their incident in 130R with the Race Clutch P1 car. The heavily damaged #41 HPD was retired after just 12 laps. Seeing former polesitters, frontrunners, and race winners scattered all throughout the final results could be evidence of the apparent curse affecting contenders this season. Or it could show just how competitive the P2 class is, with so many different teams staking a claim on the front of the field at various points in the four races completed so far. 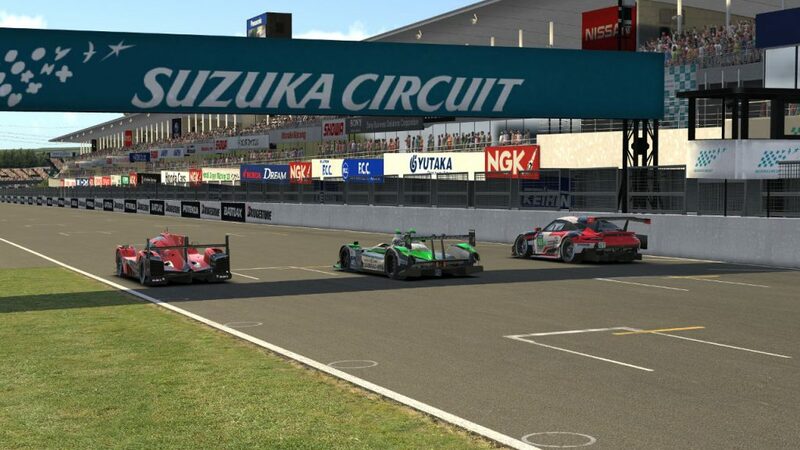 In any case, AVA Vervatic seemed to show at Suzuka that they have what it takes to reverse the curse and still fight for a win. With the championship lead back in hand, their opponents may need to search for something a bit stronger — whether it’s a voodoo doll, a witch doctor, or maybe just a faster setup — if they hope to take down the #39 car this year.